Hello all, hope someone can help me with my confusion. I've ordered u-joints from 2 different sources, based on the vehicle specifics, but when I got them, the first ones didn't fit the pinion yoke. Reordered and then they didn't fit the driveshaft yoke. This lead me to read through the CRG driveshaft report, several times along with this 14 page thread. 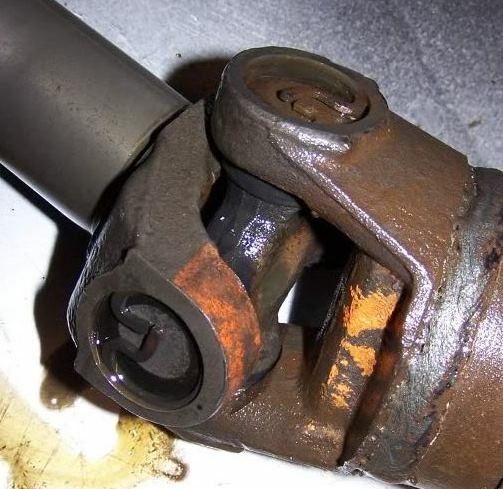 I thought I had the original correct driveshaft, but know I don't think so. The car is a 68 10A L35/TH400 car. The 12 bolt rear has a pinion yoke that takes straps and cap screws, with 1.06 dia. bearing caps but the width is @3 1/2". Cant seem to find a u-joint with the correct dimensions. If I've read the resources right, the driveshaft should be 49.96" length, in-line yokes, with HD u-joints (at both ends?) If this is correct, I'll need a combination u-joint at the rear that has the wider, large diameter caps on one axis, and the smaller 1.06 caps with the same width on the other? The driveshaft I have is 49.96, has small standard u-joint on one end, and TH400 yoke with injection molded HD u-joint at the other. Any help is appreciated. There are 3 sizes of u joint. 1310, 1330, 1350. Are you sure your pinion yoke is original? I believe the the driveshaft side uses a 1310 u joint that is about 3 1/4 inches wide. The 1330 and 1350 are larger, like 3 5/8 inches wide. There is a u joint available with 1310 on one side and 1330/1350 on the other. Sounds like that’s what you need. Measure and check. Any local parts store SHOULD have one or can order one. Thank you sir, for your response. Not sure if yoke is original, but the 12 bolt had correct date code, and gm gears dated to match car. If both u joints on the Th400 driveshaft are supposed to be the same size/ part number, the pinion yoke seems incorrect. So, the 396/Th400 driveshaft should be 49.96" with in line yokes and uses 1350 joints at each end? You did not say what year car. Check the table in the report for correct length. You will have to measure the u joint size on the driveshaft - like you did on the yoke - to make sure it will fit. 49.96 is the correct length. Does your rear u joint area look like this? If so, this should be a standard 1310 u joint. Post pics of what you have or email pics to me. I am not so sure that yours is wrong. I think it will work. You just need the proper u joints. I thought the 396/Th400 shaft for 68 had in line yokes?